Complete kit to convert from carburetor to TBI. Available for almost any make of engine with 12v ignition. I even do 1 off special order systems. Just ask. 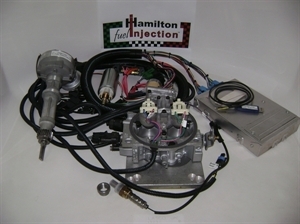 Hamilton Fuel Injection uses the highest quality thin wall high temperature wire available today. The harnesses are built with full protection from the elements using state of the art weatherpak connectors. All harnesses have a very simple 3 wire hook up (battery, ignition and ground) plus EFI components, also includes a system power and fuel pump relay. This system includes a complete TBI conversion plus a custom EFI distributor for complete fuel and spark control. Included with every kit is an ALDL USB port type data logging cable and data logging program. Making trouble diagnosis or data logging a breeze. - Custom distributor conversion to control EFI. Choose engine size, harness length, distributor , adapter plate, and add any other project comments(such as cam specs, transmission, axle ratio, etc) when ordering. Harness Length - Most vehicles including the Scout 80/800 and Scout II's will work fine with the standard 30" length harness. For larger vehicles like Travelall's and Pick-ups we suggest buying the 48" long harness. If unsure, simply measure from the back of the cylinder head to the location you plan to mount the ECM. Chose the harness length closest to your measurement. Manifold Adapter - When buying a kit for a V8 engine it will use either a Holley 2bbl adapter, 4bbl squarebore or spreadbore adapter. For inline engines you need to select a 2bbl adapter or 2-1bbl adapters for dual carb manifolds. You need to know which adapter your application will require before ordering. Distributor Versions - Most stock distributors can be converted for EFI timing control. Your distributor will need to be sent to us for conversion and will be returned with the kit unless other arrangements have been made. There are two different distributors available for the IH engine - Prestolite or Holley. Prestolite distributors have male type distributor caps while Holley uses female caps. Project Comments - When ordering its best to tell us as much info as possible about your project so we can setup both the chip and harness as close as possible first time out. The things we need to know are - Vehicle, 2 or 4 wheel drive, camshaft specifications, if its air conditioned, transmission, axle ratio, tire size and distributor being used. Also, let us know if you plan on some heavy towing. Upgrades - When ordering we suggest the performance throttle body upgrade for higher performance and larger cubic inch applications. The performance throttle body has larger bores and injectors. For stock applications we do not suggest this upgrade. This item is SPECIAL ORDER and is built to your specs. Expedited shipping is not available for this item. Expect 3 weeks for delivery time. A $100 CORE CHARGE WILL BE ADDED TO YOUR ORDER AND REFUNDED UPON RETURN OF A USABLE DISTRIBUTOR CORE. ALL SALES ARE FINAL ON FUEL INJECTION SYSTEMS. NO RETURNS ACCEPTED ON THIS ITEM AS IT IS A SPECIAL ORDER ITEM. NO EXCEPTIONS.